In a nutshell the Nerve 600SL is a bespoke British designed, Italian made road bike that offers exemplary performance. In a market as crowded with choice as the one for carbon road bikes, it takes something special to standout. The Nerve manages it. The 600 SL is the first creation from new British brand Nerve Bikes who launched at the Bespoked hand-built show earlier this year. 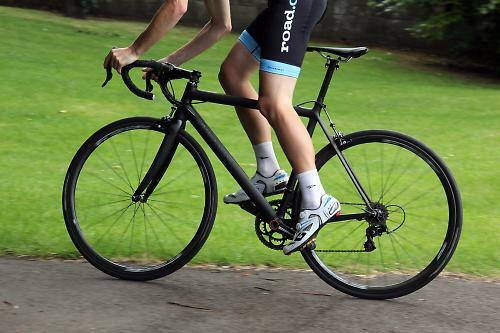 Their remit is British designed and British made steel and carbon road frames, each custom-designed for each customer. The first batch of carbon frames however are made to their exact specifications by an Italian manufacturer. This is the first frame they've produced and we were given the exclusive chance to ride and review it. There's a choice of paint schemes if the stealth black finish is a bit dull for your tastes, and as it's a bespoke frame - each one is made to order - you can tailor it to your specific demands. The 600 SL is Nerve's race-orientated performance offering; they also offer a sportive model with more relaxed geometry. There's also a disc version on the way soon. For this frame, Nerve claim a sub-700g frame weight which puts it in the same ballpark as the lightest offerings from Cervelo, Cannondale and Trek. 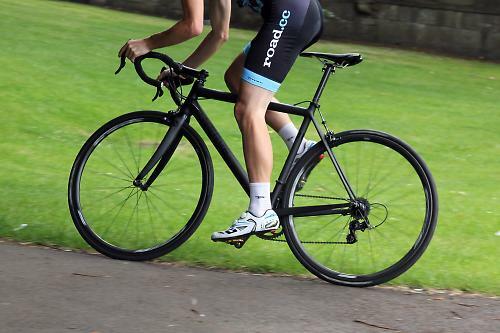 Riding any lightweight carbon road bike is a pretty special feeling. Riding one that weighs as little as the 6kg of the Nerve is even more special. It's smooth with an immediacy of acceleration that matches and, and in many cases, surpasses price-point rivals. To get under the skin of the Nerve 600 SL I embarked on a 190km ride and enlisted the services of road.cc tester Stu Kerton as campanion and route planner for the day. Starting out in Westbury we traced an undulating route west through Glastonbury before heading up the iconic Cheddar Gorge climb. Upon reaching the summit we then turned and headed east via a succession of short ramps, including the fearsome King Alfred's Tower climb, before finishing some six and a half hours later. Such a ride is a good test for any road bike. The variety of road surfaces, from smooth main roads to bumpy broken country lanes, and a variety of climbs from long and steady to short and steep, and many fast descents, provides a good showcase for any good bike to impress. The Nerve 600 SL impressed. Of course it's rabidly fast. Scorchingly quick off the mark. The sort of intoxicating point and squirt performance that will have you sprinting out of every corner every single time, just for the sheer thrill of it. Crank the gradient up and show it climb, such as the Cheddar Gorge ascent, and it scampers up with all the pace you'd expect of a 6kg bike. It sounds corny I'll admit, but the Nerve almost floats up the climb all on its own, such is the lack of power that is needed to propel it through even the steeper switchbacks. Climbing out of the saddle is a revelation, the Nerve surges smoothly forward with each revolution of the cranks. If you like your climbs, you'll love this bike. And if you don't enjoy climbs, well, this bike might just change your mind. For all its speed and acceleration, it is the handling that is the Nerve's forte. It's extremely well balanced, absolutely stable no matter the speeds involved or the roughness of the road surface. It allows you to feel the road surface for available grip and that allows you to more easily explore the limits of traction through the corners. This is a bike that is easy, and thoroughly enjoyable, to get close to the limits, but with enough feedback that there's little fear of overcooking it. You don't need to work hard to extract the performance. The most appealing aspect of the Nerve, above its low weight and stiffness, was how accessible the performance was. It delivered its speed with no sense of nervousness or twitchiness, instead it was supremely smooth and stable. At times it rode like a heavier bike, it had that sort of solidness on the road that meant it wasn't at all frightening to ride. It's delivered with smoothness and a lack of fluster and nervousness, a trait exhibited by some similarly weighted bikes. Wind it up to speed and it feels steady and planted as you weave a line through twisty country lanes, or thread it down a curving descent. Even pottering along country lanes or through Cotswolds villages, the Nerve is calm and very neutral in the straight-ahead position. Something that carbon does really well as a material, is to combine the required levels of stiffness for maximising performance, yet offering compliance to smooth out rough roads. In this regard not all carbon frames are equal, some manage the balance much better than others. There are a handful of bikes that in my opinion manage it best, and the Nerve is included in that company. During that 190km ride I mentioned earlier, the Nerve impressively dealt with the roughest road surfaces we encountered. It was astonishingly smooth and composed over broken tarmac and dealing with cracks and holes in the road. And at the end of the ride I wasn't at all tired. Well my legs were from the pedalling, but I didn't have that beat up feeling that some stiff carbon bikes can leave you feeling after just such a long ride. The Nerve is an accessible bike to ride. It's a bike that, despite the low weight, makes you feel confident and in control the whole time. I've ridden heavier bikes that feel far more skittish and on the edge of control than the Nerve. It is this aspect of its performance that shone through on that 190km ride, and every single ride, that really made the Nerve an enjoyable bike. As with any bespoke bike, Nerve will either sell you a frame, or build a bike to the specification you want. 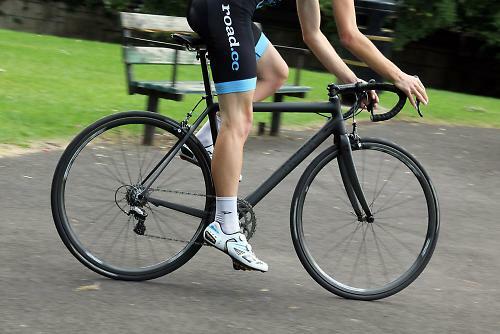 The test bike arrived with a full complement of top-end kit starring a Campagnolo Super Record 11-speed mechanical groupset providing nicely weighted shifting with slick gear changes and powerful brakes. Helping to really impress when the road tilted up where the seriously lightweight Reynolds Attack carbon clincher wheels with Continental Grand Prix 4000S 25mm tyres. The wheels have a claimed weight of 1,365g and if you ever get offered to the chance to ride such light wheels, I advise you to seize the opportunity. The 25mm tyres, for which there was enough clearance in the frame and fork, contribute to the smooth ride of the bike and allow lower pressures to be more easily run. They contribute to the Nerve's startling acceleration and turn of speed. For the purposes of comparison, I slotted some weightier aluminum box section clincher wheels and while there was obviously a drop in outright acceleration, the Nerve's character still shone through. The high-end carbon road bike market is bustling with choice, from the mainstream manufacturers like Trek, Specialized, Pinarello and Bianchi, to the smaller independents like Nerve. You don't need many fingers to count the British brands offering carbon frames, and though expensive the Nerve offers a fully bespoke option for those that want a bike that is a bit special, and one that offers outstanding performance in every way you can measure it. The only caveat to this review really is the fact this is an Italian made frame, so we look forward to following up this test when Nerve start offering British made carbon frames, as is their desire. For now though, the 600 SL is a top choice if you're in the market for a high-end carbon frame. The NERVE 600sl is one of the lightest and most remarkable racing bikes designed today. The main frame tubes are completely round for style and are constructed using 1K carbon fibre, the finest there is. Absurdly light, jaw dropping to ride and efficient with razor sharp handling. NERVE have come up with quite possibly the summit of road bike design, custom made only, you wouldn't want off the peg if tailor made was an option, would you? Did we mention it weighs only 650 grams for size 47cm. Did you enjoy riding the bike? Yes very much so. Would you consider buying the bike? If I had the money, yes. My usual critical...it's a bloody black bike can wait. The offer it with paint! I LIKE THAT! A lovely looking steed that would be on my list...if I had a list. Mobile phones all look the same due to the iphone, now the distinction between carbon bikes appear to be diminishing. Same weight as my Canyon Ultimate SLX extra small except I got a full bike with Record for £3350. Me too. Great bike and great value. Shows both can be achieved. I like that, if I wanted expensive light carbon, it would go on my list. With looks as dull as that, it's hardly going to inspire you to ride it every day. Looks very similar to my Ciocc Supremo, which is also handmade in Italy. Almost identical except for the waisted wishbone seatstays. I wonder if they are made by Ciocc? There's a choice of paint schemes if the stealth black finish is a bit dull for your tastes, and as it's a bespoke frame - each one is made to order - you can tailor it to your specific demands. ...or is there something staggeringly dull about the whole thing that you don't like ? That seatstay design is lovely - lifted straight off of Cyfac's Gothica. A good read, seems like a nice bike. However, there are so many bikes that are reviewed as good/4.5,stars. How to distinguish between them. Perhaps we should have a top 10.